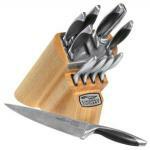 Kitchen knife sets are one of the best ways to save money when shopping for many pieces of cutlery at once. But they’re also one of the easiest ways to waste money — if you’re not careful. This is because many kitchen brands tend to focus on one or two quality kitchen knives in any one set, then fill up the rest of the knife block with small, lesser quality blades. 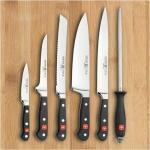 So then, what’s the trick to getting all the kitchen knives you need at the best price? Ideally, the best way to do this is to purchase two or three high-quality knives piece by piece and add to that collection as you are able to over time. Or, opt for a smaller, high-quality set instead of a cheap 20-piece block set that you’ll have to replace in 10 years. Before voyaging out into the world of knife block sets, it’s good to know what kinds of knives are out there and, more importantly, what kinds of knives you actually need. There are hundreds of block sets out there, and if you can narrow down the choices to what your crucial kitchen needs are, your shopping will be much, much easier. Chef’s Knife: This is the all-around kitchen workhorse, a must-have in any kitchen set. A chef’s knife, also called a cook’s knife, has a blade anywhere from 8 to 14 inches long. Shorter knives work best for those with smaller hands, and vice versa. Chop with the wide, heavy part of the blade near the handle, and use the thinner tip of the blade for quick mincing. If you’re going to splurge extra cash on any one knife, this is the one. Santoku: Similar to a chef’s knife, a santoku is the Japanese cutlery equivalent of the all-around workhorse blade. 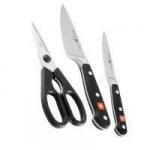 In general, these knives are shorter in length, and the blades are thinner and more lightweight. (For something longer, look for a gyuto knife instead). Another noticeable difference in most santoku knives is a granton or scalloped edge — indentation cuts made along the side of the blade that make slicing and dicing much easier, resulting in cleaner cuts. 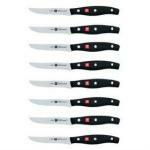 Paring Knife: These are the smallest knives in any set, and they’re often the most used. A good paring knife makes any kitchen prep task go by a lot faster. Make sure this knife has a plain edge, not a serrated edge. The straight edge will not only help with peeling and carving, but it’ll also keep your fingers safer than an uneven serrated blade. Utility Knife: This type of knife is extremely helpful if you do a lot of slicing prep work. The blade is longer than a paring knife and thinner than a chef’s knife. Bread Knife: Slicing — and not shredding — through loaves is the job of the bread knife. These blades are long, thin, and serrated so that crumbs are minimal. To use properly, let gravity do the work and gently use sawing motions to create each slice. 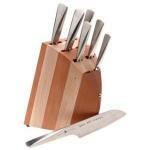 Steak Knife: Many knife block sets will include a row of steak knives to sweeten the deal. Just remember that any steak knife should have just as much quality and attention to detail as the rest of the knives in the set. Look for full tang blades and high quality steel. Both serrated or plain-edged knives are fine options; plain edges may cost more, but they can be sharpened to last longer. Carving Knife: It’s important to shop for both aesthetics and technical specs when looking at carving knife & fork sets. This is because you’ll be using this cutlery both in the kitchen and out at the buffet table for presentation. Serrated blades do well with large cuts of meat, although plain-edged blades have the advantage of on-the-spot honing to keep carved portions looking their best. Cleaver: There are plenty of knives well suited for preparing small food batches, but not many exist for breaking down large produce items or butchering whole cuts of meat. That’s because, fortunately, a good cleaver is all you’ll need. The heavier the better, up to as much as you are comfortable with. Boning Knife: This is a blade you’ll want to have on hand if you cook a lot of meat and seafood dishes from scratch. The specific shape of this knife allows the blade to easily separate flesh from bone with minimal waste. You’ll see blades ranging from stiff to flexible during your search. Stiff blades are better suited for red meats and poultry, and flexible blades (such as those found in fillet knives) work well for fish. Sushi Knife: Often a blade found in Japanese knife sets, sushi knives can also perform well in slicing, carving, and filleting tasks. Since they’re not typical Western knives, you’ll see them referred to as sashimi or yanagi knives. In European or American sets, they may be called salmon knives. 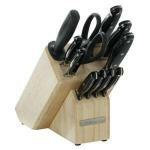 Many knife block sets will also include a pair of kitchen shears and a sharpening steel to keep the knife blades intact. Both are a helpful bonus to any set. 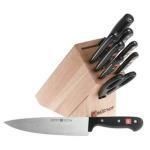 For a gourmet-quality Japanese starter set, look no further than the Global Santoku Knife Set. The cut and angle will take some getting used to if you haven’t worked with Japanese cutlery before, but once you start, there’s an excellent chance you’ll never go back. The balance and attention to detail are impeccable. Each knife is forged from one solid piece of steel and is balanced with grains of sand in the handles. 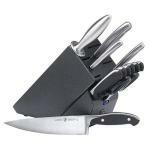 This starter set includes a santoku, utility, and paring knife. If interested in an East-meets-West approach, try the J.A. 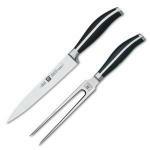 Henckels Twin Signature Asian 2-piece starter set. Both chef’s and paring knives are forged in the knife steel capital of the world — Solingen, Germany — but feature lightweight granton blades. It’s rare to see a granton paring knife, and that’s one of the many reasons why this set stands out. Henckels also makes several classic Western starter sets like this Twin Cuisine set with chef’s knife, utility knife, paring knife, and sharpening steel. 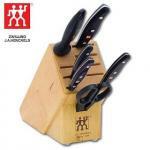 These plain-edged, extremely sharp knives are full tang and extend into ergonomic handles. 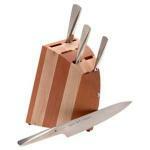 Two knife block sets that we like are the Chicago Cutlery Walnut Tradition set and the J.A. Henckels International Forged Synergy set. Choose the Chicago Cutlery set for a well-rounded collection of kitchen knives with black walnut handles, or go with the Henckels Forged Synergy set if you favor a customized approach. The large knife block includes only four kitchen knives and a set of steak knives, leaving you room to fill in the extra spaces with knives of your choosing. 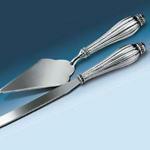 The Godinger Cake Server Set will require a return to older times when polishing the silver was a regular household task. This ornate fluted handle pattern is silver plated and will need a good polish before special occasions. These Green Mountain Zirconium Oxide Knives in a set of four are actually the same two knife set, repeated. If you want a set of one 5" and one 4" blade for yourself and a set for a friend, that can be a good thing. Otherwise, now you have spares. A set of five prep knives in one of Wusthof's oldest patterns, this Classic block set might have been near the top of the heap twenty years ago--now it's a good set that needs some help. Practical knives designed with elegant presentation in mind, these three solid stainless steel blades handle the full range of cheese textures, from hard Parmesan to soft Camembert. The set is suited to dining service as well as kitchen work. This set of five Chic Chefs ceramic blade knives, complete with a hardwood knife block, offers two paring knives, a small utility knife, serrated bread knife, and chef's knife--all with features and limitations unique to zirconium oxide cutlery. A fine basic set of Chef's knives either for the professional or the serious home chef, this four knife collection comes in a soft sided carrying case emblazoned with the company logo--everyone will immediately know you have the best. Be ready to prove it. This combination Cheese Knife Set, knife rack and storage block, and reversible serving tray cutting board from Berghoff Worldwide really does have a nice look. Either on kitchen counter or dining room table it will be a useful and stylish serving accessory or prepping platform. 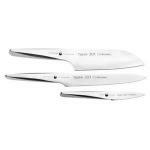 Designed by F. A. Porsche, this three piece set of Chroma Haiku Type 301 knives brings a space age look to your kitchen and yet makes perfect practical sense. So simple in appearance, there's much going on beneath the surface of these one piece stainless steel chef's knives. This heavy but ergonomically sound seven piece cutlery set in the counterbalanced Orion design from Berghoff Cutlery of Germany may be a reasonable choice for cooks who prefer the older European patterns. In comparison to lighter modern knife sets with thinner blades they will feel a bit overbuilt. This set of four fine edge steak knives from designer F. A. Porsche reflects the same level of quality and evolved style that has earned the Chroma 301 line numerous awards. Eye catching without being gaudy, everyone will know there's something special here. If you absolutely hate sharpening knives you've probably looked at many "never sharpen" ideas. You may remember the knife that cuts through a tin can and then effortlessly slices a tomato, paper thin. Hopefully you won't try that if you buy this set. Obviously the revolution in cutlery hasn't filtered down to Brazil as yet--this set of three fundamental knives from Mundial, a well established South American company with 70 years of solid experience, is definitely old style and proud of it. Designed as much for the dining table as for the kitchen, this carving set from J. A. Henckels has features practical for both, expressed in a design that makes both functional and aesthetic good sense. Amongst the first companies offering Japanese knives to the US mass market, Global earned a spot in the hearts of cooks everywhere, including chef turned author, Tony Bourdain. 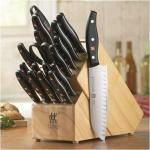 I've never been a big fan of knife block sets. They rarely offer what I would consider to be the optimal mix of knives and offer poor value as they often have more "filler" knives than the types of knives which are most useful.